18 A None No Power Seat 18 A is a standard Business Class seat whose proximity to the galley may be bothersome. 18 K None No Power Seat 18 K is a standard Business Class seat whose proximity to the galley may be bothersome. 19 G None No Power Seat 19 G is a standard Business Class seat whose proximity to the lavatory may be bothersome. 39 D None No Power Seat 39 D is a standard Economy Class seat that has extra legroom due to the position of the bulkhead. There is no floor storage at this seat during takeoff and landing. 39 E None No Power Seat 39 E is a standard Economy Class seat that has extra legroom due to the position of the bulkhead. There is no floor storage at this seat during takeoff and landing. 39 F None No Power Seat 39 F is a standard Economy Class seat that has extra legroom due to the position of the bulkhead. There is no floor storage at this seat during takeoff and landing. 39 G None No Power Seat 39 G is a standard Economy Class seat that has extra legroom due to the position of the bulkhead. There is no floor storage at this seat during takeoff and landing. 49 H None No Power Seat 49 H is a standard Economy Class seat whose proximity to the lavatories may be bothersome. 49 K None No Power Seat 49 K is a standard Economy Class seat whose proximity to the lavatories may be bothersome. 50 A None No Power Seat 50 A is a standard Economy Class seat whose proximity to the lavatories may be bothersome. 50 C None No Power Seat 50 C is a standard Economy Class seat whose proximity to the lavatories may be bothersome. 50 D None No Power Seat 50 D is a standard Economy Class seat whose proximity to the lavatories may be bothersome. 50 E None No Power Seat 50 E is a standard Economy Class seat whose proximity to the lavatories may be bothersome. 50 F None No Power Seat 50 F is a standard Economy Class seat whose proximity to the lavatories may be bothersome. 50 G None No Power Seat 50 G is a standard Economy Class seat whose proximity to the lavatories may be bothersome. 59 A None No Power Seat 59 A is a standard Economy Class seat that has extra legroom due to the exit. An extra surcharge may be required to book this seat. This seat is missing a window. 59 C None No Power Seat 59 C is a standard Economy Class seat that has extra legroom due to the exit. An extra surcharge may be required to book this seat. 59 D None No Power Seat 59 D is a standard Economy Class seat with extra legroom due to the position of the bulkhead however, the proximity to the lavatories may be bothersome. 59 E None No Power Seat 59 E is a standard Economy Class seat with extra legroom due to the position of the bulkhead however, the proximity to the lavatories may be bothersome. 59 F None No Power Seat 59 F is a standard Economy Class seat with extra legroom due to the position of the bulkhead however, the proximity to the lavatories may be bothersome. 59 G None No Power Seat 59 G is a standard Economy Class seat with extra legroom due to the position of the bulkhead however, the proximity to the lavatories may be bothersome. 59 H None No Power Seat 59 H is a standard Economy Class seat that has extra legroom due to the exit. An extra surcharge may be required to book this seat. 59 K None No Power Seat 59 K is a standard Economy Class seat that has extra legroom due to the exit. An extra surcharge may be required to book this seat. 70 G None No Power Seat 70 G is a standard Economy Class seat, however, other flyers tend to bump into this seat. 74 C None No Power Seat 74 C is a standard Economy Class seat, however, the proximity to the galley may be bothersome. 74 H None No Power Seat 74 H is a standard Economy Class seat in the last row of the aircraft whose proximity to the galleys may be bothersome. 74 K None No Power Seat 74 K is a standard Economy Class seat in the last row of the aircraft whose proximity to the galleys may be bothersome. 75 A None No Power Seat 75 A is a standard Economy Class seat in the last row of the aircraft whose proximity to the galleys may be bothersome. 75 C None No Power Seat 75 C is a standard Economy Class seat in the last row of the aircraft whose proximity to the galleys may be bothersome. 75 D None No Power Seat 75 D is a standard Economy Class seat in the last row of the aircraft whose proximity to the galleys may be bothersome. 75 E None No Power Seat 75 E is a standard Economy Class seat in the last row of the aircraft whose proximity to the galleys may be bothersome. 75 G None No Power Seat 75 G is a standard Economy Class seat in the last row of the aircraft whose proximity to the galleys may be bothersome. 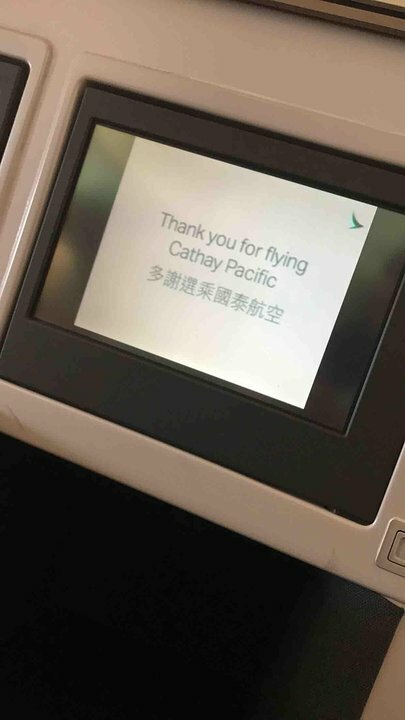 This version of Cathay Pacific's Airbus A330-300 is operated in a two class configuration with 39 angled-flat bed Business Class seats and 223 standard Economy seats. This seat were great, same as excellent Cathay seat on every longhaul fleet, despite the fact this plane only used in mediumhaul Subcontinent routes (India, Sri Lanka and Malé). 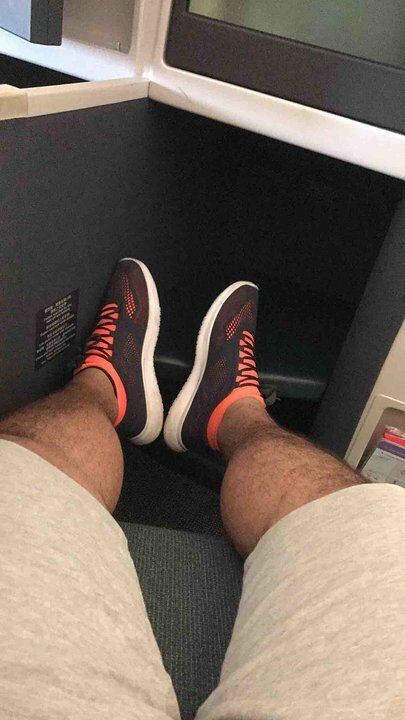 I was traveling from Delhi to JFK via Hong Kong (using 70000 Mileage Plan includes first class on latter sector), the service was okay and I didn't take any food, since I slept most of the way.